The Central Bureau of Investigation has filed a chargesheet in the case involving a national level shooter Tara Shahdeo, who had in 2014 claimed that she was pressurised and tortured by her in-laws to accept Islam after she married a person, who she thought was a Hindu. The incident had come to light in August 2014, when Tara left the house of her in-laws and made these shocking charges. She was barely married for a month before she had to walk out of it to save her dignity and choice of following her religion. Tara had married another shooting professional named Ranjeet Kumar Kohli on 7 July 2014 in Ranchi. Ranjeet reportedly had been doing well professionally and was well connected with high profile people. Tara had met Ranjeet the same year earlier during shooting practice. He started courting her and later proposed to her, to which she agreed. He wanted to spread communal tension and start communal riots. Both were married as per Hindu rituals but Tara says that just a day after the wedding, she came to know that Ranjeet was not a Hindu. His real name was Raqibul Hasan Khan and he was a Muslim. Due to this reason, this incident was reported as a possible case of ‘Love Jihad’ back in 2014. Now with the CBI filing the chargesheet against Ranjeet alias Raqibul, his mother Kaushal Rani, and Mushtaq Ahmed, the then Registrar (vigilance) of the Jharkhand High Court, more details are emerging. According to reports, both Raqibul and his mother used to mentally and physically torture Tara, asking her to accept Islam if she wanted her married life to be normal. “Either change your religion, or partners in your bed will keep changing,” Raqibul’s mother is alleged to have threatened Tara. She was strictly warned not to apply ‘sindoor’, failing which her hands will be broken. There were dowry demands too from the in-laws, Tara had alleged. A group of maulvis were also called a couple of days after their wedding where Tara was asked to convert. 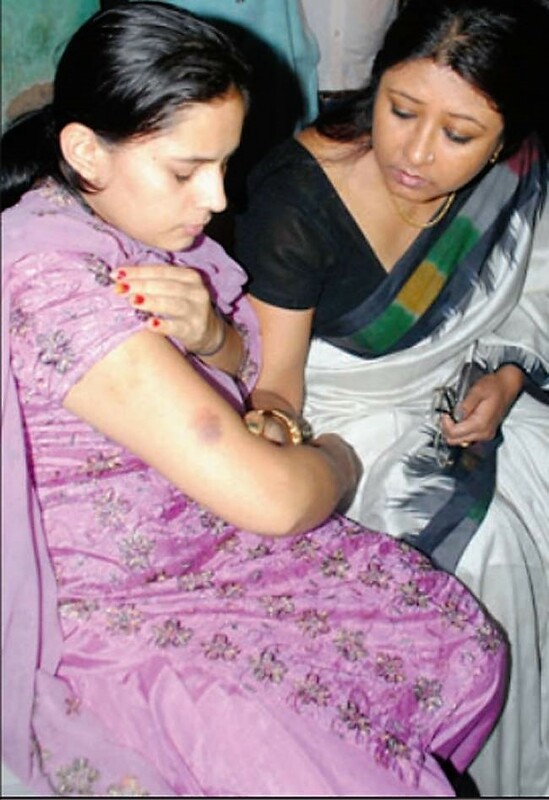 Tara alleges that she was beaten up badly when she refused. She was further threatened that not only her, her family members will also be killed if she opened her mouth, Tara alleges. The torture continued for a month before Tara decided to break free. As per reports, she used mobile phone of a domestic help on 17 August 2014 to call her brother and asked him to come to her in-laws’ house along with police. The incident came to public knowledge thereafter. Pictures of a distraught Tara with injury marks, including of cigarette burns, were proof enough that something was wrong and a case was registered. Tara had to be hospitalised after she was rescued from the torture. Raqibul Hasan Khan later accepted that he had physically assaulted Tara but denied putting pressure for religion conversion. He was subsequently sent to judicial custody on 27 August and he is lodged in a Ranchi jail ever since. His mother was given bail though in the case. The High Court had asked the CBI to investigate the case and the case was transferred to the central agency in May 2015. CBI now has filed the chargesheet under sections of criminal conspiracy, sexual assault, domestic violence and for fraudulently organising marriage ceremony without lawful marriage.